Now smoking Watch City Simply Red in a 1980s White Pipe straight, smooth octagonal paneled billiard meerschaum with an acrylic yellow cream colored saddle stem. This blend will smoke slower than the last three. Going back to work and listening to the Yankees-Red Sox. Relaxing after a wonderful barbecued chicken legs and mashed potatoes dinner with the next to last slice of banana pudding cake for dessert. Now smoking Watch City 4th Nun Returns in a 2002 smooth natural straight silver banded Ardor Venere Extra Fatta A Mano Maigret billiard, signed by Dorelio Rovera and a black acrylic tapered stem. Watching the Braves-D-Backs game. Now smoking D&R Raccoon’s Delight in a 2004 Stanwell EM 2004 black sandblasted straight billiard in a gold accent ring on the shank and gold “s” on the black tapered acrylic stem. Going to work soon. Enjoyed a tasty navel orange, and am a quarter of the way through this bowl of 2013 Capstan Blue in a 2014 Savinelli Gaius smooth brown slight bend black acrylic stem and ferrule 320KS author. Working and listening to Bob Dylan's Theme Time Radio Hour. A couple minutes away from smoking D&R Raccoon’s Accent in a pre-1980s straight dark brown Comoy's Sandblast 186 billiard with a black vulcanite tapered stem. Took a moment to fed silly ol' Molly. Just finished work and bowl of Jim's Evolving Work Blend in a 2003 Stanwell Golden Danish 56 Rusticated Canadian with a black vulcanite stem. A quarter of the way through this bowl of Edgeworth Ready Rubbed Match in a late '80s, early 90s small bend medium brown smooth, unbranded Nording pot with a couple small rusticated spots, an amber colored acrylic ferrule and tapered stem in the military mount style. Not far from finishing this bowl of year 2014 Edward G. Robinson's Pipe Blend in a 2014 Basil Meadows smooth slight bend squashed tomato with an aluminum band and a black pearl acrylic stem. 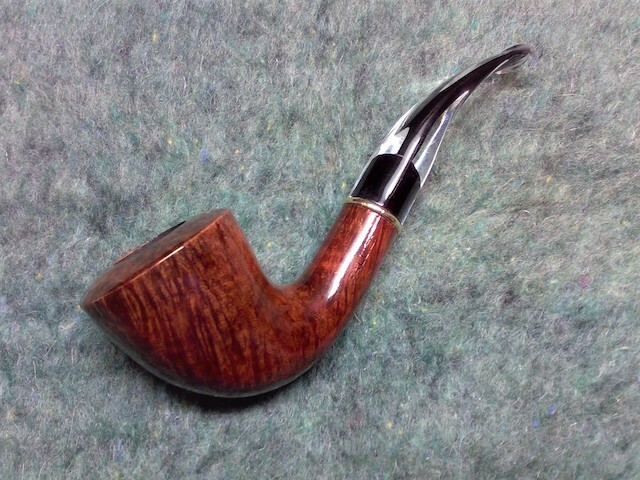 Close to finishing this bowl of Sutliff Prince Albert Match in an old grain relief, partly smooth full bend "V" shape bowl Preben Holm Ben Wade Prominence freehand with the letter A and the numeral 2 in circles with a black vulcanite stem and ferrule in the military mount style. A bottle of Cheerwine made with pure cane sugar is my drink. Been busy arguing baseball trivia with a friend. Enjoyed a tasty spaghettl and meatballs lunch and am part way through this bowl of Peretti Park Square in a smooth straight Lane era Charatan Executive Extra Large stretch apple with diagonal channel cuts on the lower right and left of the bowl along with a black vulcanite double comfort saddle stem. This pipe was formerly owned by actor William Conrad. Listening to the Reds-Brewers game as I do some work. Close to finishing this bowl of MacBaren Burley London Blend in a 2002 smooth Rinaldo Silver Line 3 EGER 05 paneled horn with a black acrylic stem. Now smoking the last of this sample of year 2005 Tavern Tobacco Laurel Flake in a slight bend 1968 group 4S Dunhill Shell 475 cherrywood with a black vulcanite tapered stem. Ice water and bergs is my evening drink. Watch City’s 558 Flake in a Kirk Bosi poker with ice water. Enjoying a bowl of 2010 Gawith Hoggarth Dark Flake unscented in an old Stanwell golden danish. Grangestone 12 yr scotch in the glass, Charlie Parker “Jam Session” on the Bluetooth speaker. Wishing everyone a relaxing evening....my 4 day weekend begins now. Not too far away from finishing this bowl of Peretti Coffee Blend in a 1979 smooth slight bend H. Jones Ltd. Easy Loader 391 Dublin with a black vulcanite stem. Then it's dinner time. Relaxing after a wonderful pork chops and mac 'n cheese dinner with a hot fudge sundae for dessert. Now smoking Dunhill Elizabethan Match in a 1982 smooth straight Dunhill Root Briar 31051 Dublin with a black vulcanite tapered stem. Going to work in a couple minutes as I listen to the Braves-D-Backs game. Comoy’s Cask #2 in a cob. Almost half way through this bowl of Watch City Simply Red in a 1980s White Pipe straight, smooth octagonal paneled billiard meerschaum with an acrylic yellow cream colored saddle stem. Taking a work break to watch the ball game I've been listening to. Part way through this bowl of Esoterica Dunbar in a smooth straight late ‘50s, early 1960s Lane era Charatan Selected 43 Dublin with a black vulcanite double comfort saddle stem. This pipe was formerly owned by actor William Conrad. A couple of minutes or so away from smoking D&R Raccoon’s Delight in a smooth 1976 Canadian GBD Seventy Six 256 with a black vulcanite saddle stem. Working and listening to the A's-Astros game.